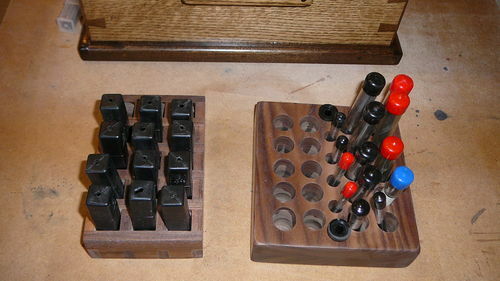 I’ve owned the Leigh dovetail jig and the Leigh Mortise and Tenon jig for a few years now. There are lots of pieces and parts, as well as extremely helpful, well written user’s manuals that come along with these top quality jigs. Until now, everything has been unceremoniously dumped in a couple of drawers here and there which makes finding the necessary parts a bit like a scavenger hunt. A storage box for the parts has been on the to do list for quite some time. 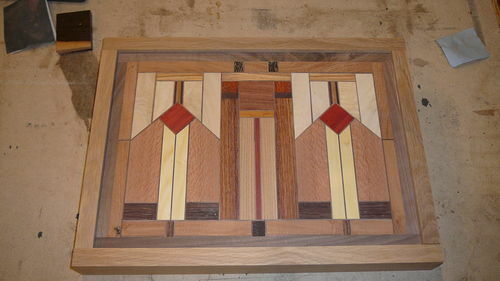 Mosaic/inlay – 3/8”, mesquite, citrus, lacewood, maple, chakte viga, redheart, bloodwood, katalox, granadillo, wenge, black palm, chestnut, walnut. What would accommodate all of the bits and pieces? The router base for the M&T jig is a large piece of aluminum with a couple of indexing pins on the bottom side. A tray would provide a flat surface to store it. 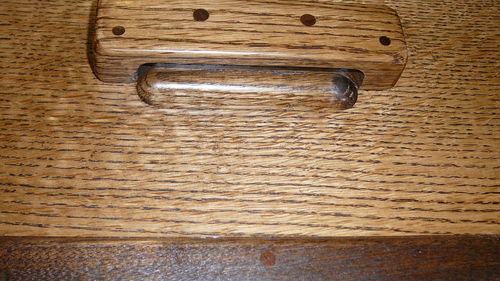 Holes were needed for the pins and finger holes to remove the tray. The M&T templates were 4-1/2” tall which meant the insert needed to be that tall so the tray would be flush with the top of the insert. 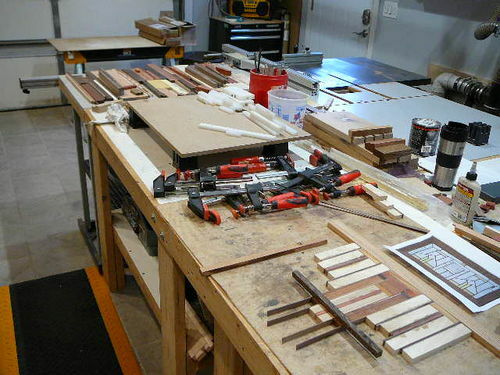 Similarly, storing router bits vertically would eliminate riffling through a cluttered heap of plastic tubes with bits in them to find a bit. I also wanted a place to keep the user’s manuals where they would be readily accessible without getting in the way. After discussing the ideas with fellow LJ’s (Spring Swap forum folks) and tweaking things a bit the final layout came together. The box sides and lid sides were not made from a single piece. After making the 1/2 blind dovetails for the sides I changed my mind about the lid and decided to make a dome type lid rather than a basic flat lid. 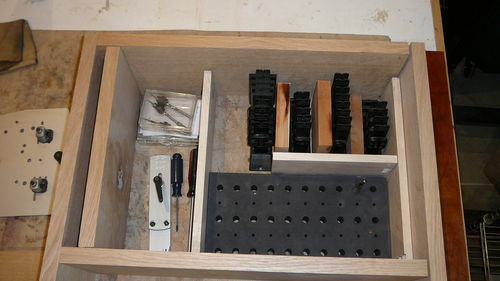 That made matching the dovetails a bit tricky as well as getting the lid and sides to line up cleanly. Rather than just using a square piece of wood as a handle, I routered a rounded indentation in the side of the box and also made a hidden recess in the handle for a better hold and also to keep the handles from protruding further from the sides. After building the box and lid, all that was left was the inlaid lid. 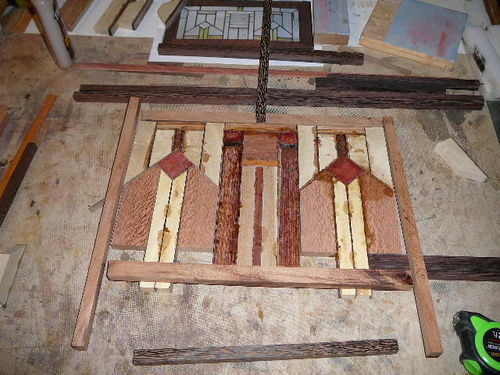 A Google search of “Craftsman stained glass” provided plenty of ideas. After everything was glued together, the inlay was run through the planer. I was terrified that the planer blades would destroy the piece due to all of the different grain orientations, small pieces, and different wood densities. With the DW-735 setting on “finishing” (2x cpi) everything went well. There was some very minor shredding on the walnut around the edges since the grain was parallel to the blades. After planing, the top was glued to a 1/8” piece of plywood. A 1/2 rabbet was cut into the lid side pieces for the top. 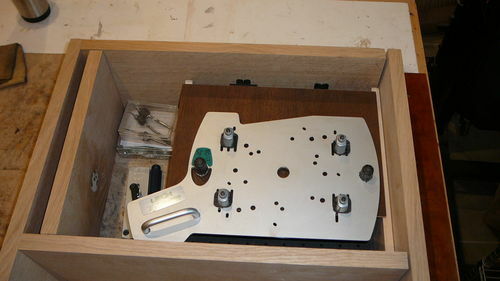 Another slot (1/8”) was made for the plywood that would make the pocket to store the manuals. All told, the lid is 1-7/8” tall, with a 1/2” pocket for the manuals. It’s a bit too tight for both manuals. After putting a few of the spiral bits in the foam (and cutting my finger) I decided to leave them in the plastic tubes. Rather than the foam insert, I will make a wood insert with holes large enough to accommodate the plastic tubes. Round ones for the spiral bits protectors and square ones for the dovetail bit boxes. 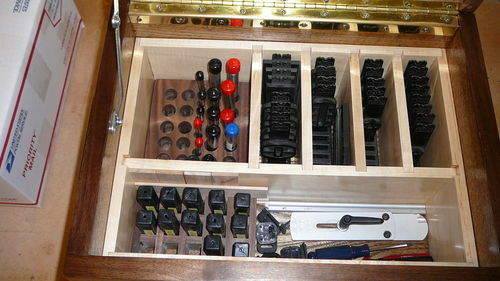 I still need to come up with a good design for multi-purpose storage boxes for the main jigs. I replaced the foam inserts with wood inserts so the bits can be left in their protective plastic sleeves and I won’t cut my fingers more. This thing weighs a ton. Maybe I should have used 3/4” rather than 7/8”. At least it’s solid. Beautiful work. Congratulations on a job so well done. Nice box, I really like the top. Not to dismiss the utility of the box, I’m fascinated by how great that inlay looks! Excellent. All of my MT plastic guides are in a cigar box, manuals are separate, router bits are separate, and the router top thing has fallen on the floor a couple times. I really need to do this badly. Beautiful, inspiring, and useful – great job! Awesome, Earl. Ridiculous, of course. 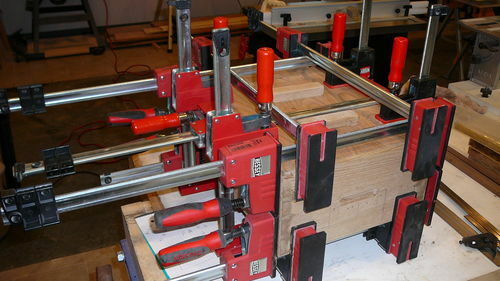 :-) Did you use the Leigh jig to cut the HB dovetails? If so—super-nice job! They are perfect. When you’re about to die, please send me a text so I can come to the auction! The box…and especialy the top, looks awesome. Thanks for all of the kind comments. Making inlays like this is something I enjoy. 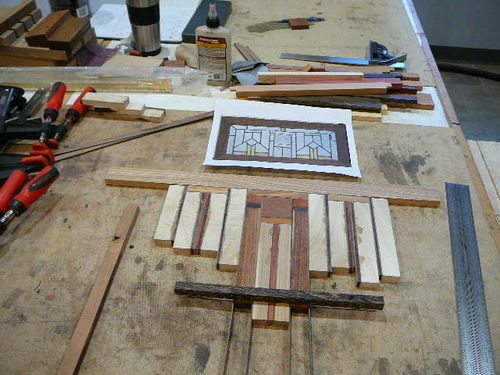 There are so many amazing Craftsman style stained glass pictures that I will never run out of ideas. I’d like to get good enough that I can make Harvey Ellis type designs. Dave – thanks for the input on the design and the mesquite and citrus. Wonderful storage box. Thanks for showing you build technique. The inlay is a real eye catcher as is you excellent half blind dovetails. 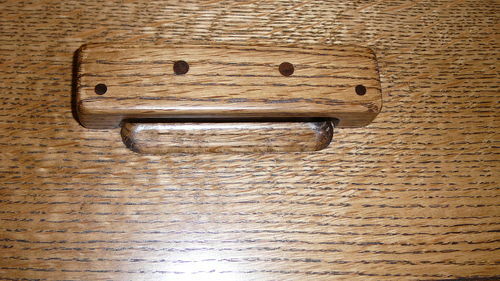 Hope to use your inlay idea for an arts and crafts chest or bench. Beautiful box Earl. I’d say it’s way too good for the intended use, but then why shouldn’t it be? ;) Big thumbs up! Over the top, Earl. Ridiculous and absurd, yet practical and sensible.